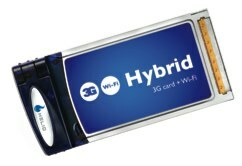 Fledgling mobile virtual network operator (MVNO) Helio has announced a data card called the Hybrid. With the Hybrid, Helio becomes the first MVNO to offer a data card. The card itself is based off the Sierra AirCard 580. Despite the name, Helio's Hybrid card only offers EV-DO Rev 0 connectivity. Bundled software allows a seamless connection between WiFi and the data card for Windows notebooks that have built-in WiFi. Pricing for unlimited data access with the Hybrid is $85 monthly. The card is provided for free with a 2-year activation. Access to Boingo's 45,000 WiFi hotspots is included in the monthly fee. Helio is a joint partnership between SK Telecom and Earthlink that began reselling mobile service earlier this year. It was founded with $440 million in venture capital.